From the glass on the table to the sight of the beer frothing up, to the sights and sounds of the barroom and beyond, our world usually feels solid and reliable enough. It is an illusion, however—nothing more than a projection created by our highly fallible perceptions. Ancient wisdom makes a point of it; modern science increasingly verifies this unsettling truth. Of all of our senses, we rely most confidently on vision. “Seeing is believing” is a phrase that reflects absolute surety. After all, we drive cars, take aim at our prey, choose a mate and take on many other tasks with a pretty high degree of visual confidence. Our eyes provide a spectacularly detailed view of the world, but they are not immune to being tricked, as any simple optical illusion demonstrates. When it comes to food and drink, our reliance on vision is a huge problem, because it can force us to taste and smell what we see, whether it’s actually there or not. All our senses are deeply intertwined, working in parallel to combine multiple threads of information into a single picture. If we see dark colors in a beer, for example, we almost always find dark flavors, even if they’re not there. This can happen even if we make a conscious effort to avoid it; isolating a single sensory input is not easy. Furthermore, the visual system is wired to higher centers of consciousness in ways that the chemical senses are not, giving it the power to be a bit of a bully. Research has shown that when wine judges are presented with white wine tinted with red pigments, their responses are not the expected peach and citrus, but bramble and berry. Although no research has been done (as far as I know), beer tinted with caramel color would likely elicit comments about roast and chocolate. Before craft beer returned us all to sanity, dark or bock beer in the U.S. was usually made by squirting a little caramel color into a pale lager, and consumers found the beers satisfying enough back in the day. I know I did. I just returned from judging beer in Rio de Janeiro at the Mondiale de la Bière. The Brazilian judges, mostly trained sommelier-style, spent a lot of time swirling, tilting and holding their glasses up to the light, trying to extract as much information as possible from the beer’s appearance. The three of us nonlocal judges watched this and confided that we’d hardly given the beers a second glance. We did note the color, clarity and state of the head, but after that we had our noses pretty firmly planted in the glassware, where the action is. 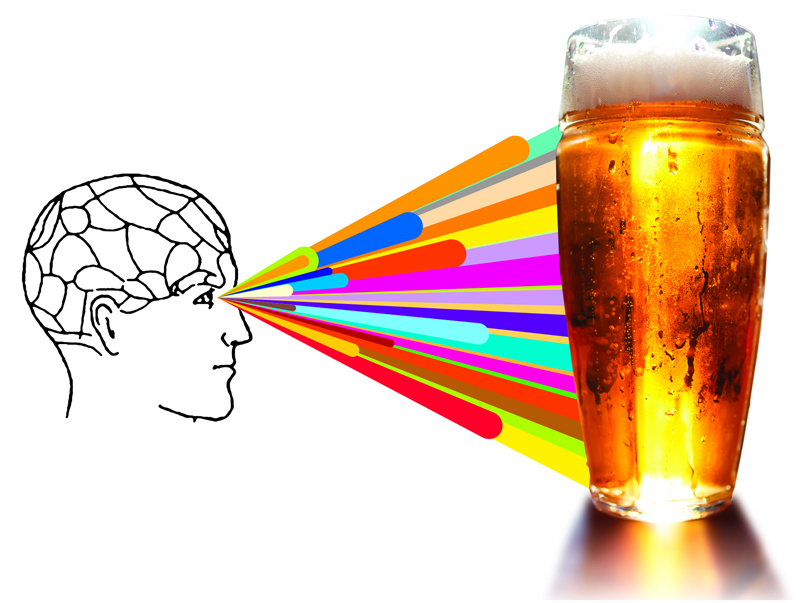 However appealing they may be, visual clues tell you nothing about beer’s 1,000-plus aromatic chemicals and its many taste and mouthfeel sensations. For judges and enthusiasts alike, you have to really focus on aroma and taste, and not give too much weight to what you see. It becomes easier as you develop your vocabulary and technique, but it takes some practice. Beer is so much more complicated than it appears, hence the brewing school axiom: “Color is not a flavor outcome.” For any particular shade of beer, there are limitless ways to get there. Brewers can choose from dozens of malts, from ghost-pale to nearly carbonized. Each one’s flavor is based on the specifics of its kilning. Not only does each shade of color have a different set of flavors, but malts of the same color can also have dramatically different flavors. Let’s consider porter as an example. It’s a dark brown beer, not quite fully black. Over the course of its long history, it has been brewed from many different kinds of recipes. In the beginning, a dark malt called “brown” was the primary ingredient, producing a rich and toasty palate. When instrumentation put a focus on efficiency, recipes turned away from this ingredient. After a few decades of experimentation with burnt sugar and even licorice as colorants, formulas in the 1820s began to employ the newly developed black “patent” malt, and this basic approach has been the framework for porter ever since. But brewers still have boundless choices to make for their porter recipes. They can stick to the early recipes and use a fair amount of brown malt for a gentle toastiness or go the more modern route of using mainly pale malt, with the beer’s color derived from deeply roasted black malt for a smooth chocolaty experience. In between are other very different flavor possibilities. Chocolate malts are midway between brown and black malts, and come in several shades. In my opinion, chocolate malt is badly misnamed; its sharp roasted notes are more reminiscent of coffee than chocolate. And we also need to think about the malts in this dark beer other than the ones that provide its color. Vienna or Munich malts will bring caramel and cookie flavors; caramel malts introduce flavors ranging from light caramel to raisin and prune and on to burnt marshmallow; biscuit/amber malts adds a bright toastiness. Finally, black malts are a varied lot, and unmalted roasted barley has a sharp, acrid roastiness that is the hallmark of Irish-style stouts. That’s a lot of possibilities, and your eyes will tell you nothing about any of them. Porter is just an example here. With any style of beer there are many different ingredient routes to get to the same color. From a presentation point of view, we need to understand the importance of visual clues for both trained tasters and casual drinkers. Style-appropriate color and clarity and a tight, long-lasting head are essential to set the stage for the tasting that follows. This is especially important in competitions. According to competition guidelines, appearance is generally supposed to have only minor significance. However, a beer that is too light or dark for its style will distort the experience, and judges will find on the palate what their eyes foretell—even if they are well-trained. This is why it is not unheard-of for wines and occasionally beer to be judged in black glassware. There is a lot of mumbo-jumbo out there about wine and beer glasses, and whatever physics and physiology might ultimately prove, one thing is certain: presented with the same drink in two different glasses, the glass perceived as more “special” will definitely cause people to take notice and extract more pleasure from its contents. When I’m doing conducted tastings, I often use wine glasses. Every time, I get some raised eyebrows and comments like, “Oh, beer in a wine glass?” I firmly believe people take beer a little more seriously in a context that demands that they approach it differently than they normally might. Belgian brewers have made glassware an important part of their beer experience for quite a while, to their great advantage. Recent research into the realm of cross-sensory experiences is quite spooky. A strawberry will taste sweeter on a white plate than a black one, and sweeter on a round plate than a square one. Of course, marketers have known for decades that packaging is not just about functionality or conveyance of basic information, but sets the stage emotionally and creates expectations that prime the consumer to look for ways to have their expectations met. Brands and their histories shape the experience, as well. Call it deception if you like, but these outside influences do actually change the way the products taste—a very good reason why competitions are judged blind. It might be a good exercise to take a few of your favorite beers, plus a ringer or two, and have somebody serve them to you blind. You might be surprised at your genuine, untainted reaction. So, how to stay strong when our senses lay such traps for us? First, be aware and always try to keep the senses aimed where you can get the most information. Second, really focus on the sensations and let the information flood in. Aroma particularly benefits from a very open and accepting mind. Collect and record your impressions first and categorize them later, and always try to be open to unexpected sensations. Keep that big model of reality in your head as detailed and up-to-date as possible. This open-minded attentiveness is at the core of successful tasting, but come to think of it, it’s actually a pretty good way to live your life in general.